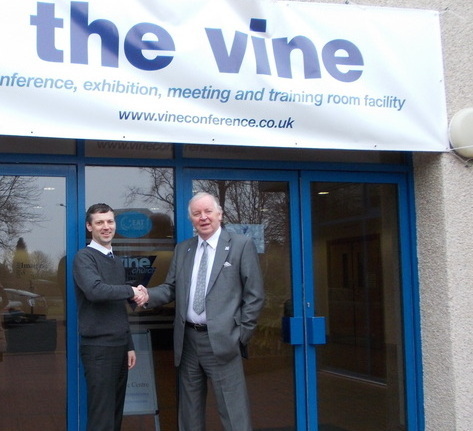 Local MSP Bill Walker recently visited the newly renamed Vine Conference Centre in Dunfermline to officially launch its rebranding. For the past 6 years, the building has operated as the Vine Venue but the management felt this did not fully promote what it has to offer. The Centre boasts an auditorium capable of seating 550 people and has rooms available for smaller meetings and interviews. The Centre has onsite parking for 90 cars and is located just five minutes walk from the Queen Margaret Train Station and a few minutes drive from Halbeath Road. Keen to support the local economy, the management use a Dunfermline-based company to provide corporate hospitality. Mr Walker said: “The Vine Conference Centre is an impressive facility. It’s great to see a Dunfermline business evolving and managing to survive during this recession.